A charitable housing complex may be one of the last places you’d expect to find a group of Twitter coworkers gathered together on a Friday morning. But early on June 6th, they met up to join forces with the San Francisco-based WiFi organization called Inveneo to bring high-performing Internet access to Compass Clara House, a transitional housing program of Compass Family Services that helps homeless families get back on their feet. Inveneo Engineer Sam Perales discussing installation plans with Twitter volunteers. Based in San Francisco, Compass Clara House consists of 13 apartments housing 13 families, which vary in size. Parents and their children live in an apartment for up to two years and are offered services including employment counseling, enriched childcare, counseling and therapy and an afterschool program. During their stay, parents are enrolled in an either an education or program with the goal of finding a self-sustaining job and all families are working towards finding a permanent home. Twice a year Twitter encourages communities to band together and volunteer time at local charities. This program – known as #FridayforGood – brought Inveneo staff members together with Twitter employees. The Clara House’s Internet connection was slow and left residents frustrated while they tried to look for jobs online. It was time to create a faster and more reliable link for the residents and their families. Twitter and Inveneo brought 15 volunteers for the day. Sam Perales, Inveneo’s Senior Field Engineer, and Aaron Mason, Inveneo’s previous Sr. Marketing and Communications Manager, led the team. The event was also managed by one of San Francisco’s community leaders, Mike McCarthy. 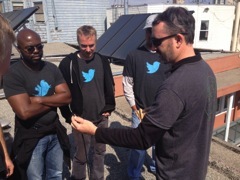 Step by step, Inveneo guided Twitter employees on how to survey the building, run cables, and install the equipment. As soon as individual access points were plugged in, they were connected to the city’s WiFi configurations and fiber ring. By the end of the day the whole building was covered with better WiFi connectivity. Twitter volunteers assembling wireless radio antenna mount. The Clara House’s new WiFi connection is now 15 Mbps, and the residents now have Internet that’s 10 to 15 times faster than before. Aaron Mason reported that as soon as the WiFi connection was up a few of the building’s kids rushed to try their online games. 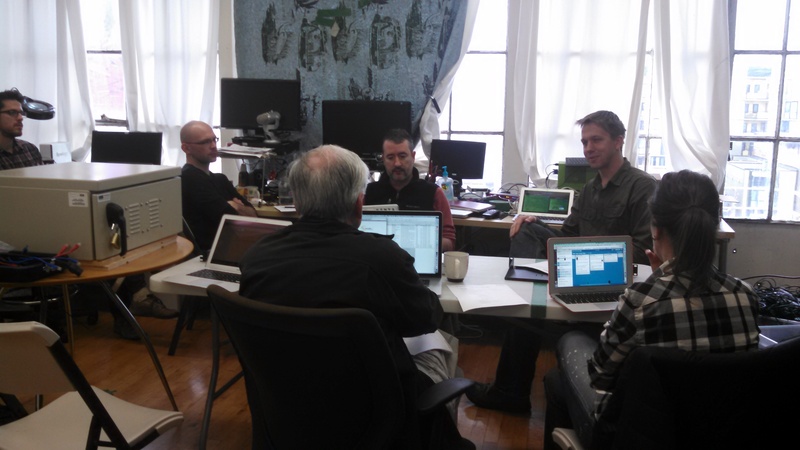 The city of San Francisco is currently offering bandwidth and is working to bring city housing online. Current residents of Clara House do not pay for the Internet because the city is giving the building broadband access for free. If you would like to learn more about Twitter’s Friday for Good program or how you can get involved, please visit the Twitter blog. Members of the team connecting WiFi access points on top of Clara House. Inveneo’s Senior Field Engineer Sam Perales has travelled to more than 10 countries to work on ICT projects, but his latest project was particularly special because of the collaboration between United Methodist Communications (UMCom) and local community members. Sam Perales with UMCom’s April, United Methodist Bishop Pete Torio, his wife Joyce, and the rest of Bishop’s team. 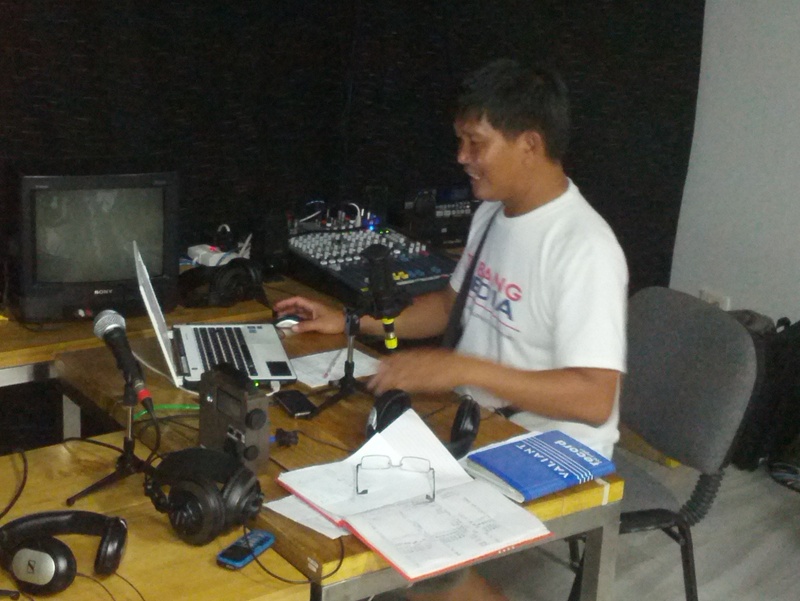 Last month Sam was in the Philippines in support of Inveneo’s typhoon relief efforts. He was asked by UMCom to add on a trip to the Baguio city region to design and implement an Internet link for the United Methodist Bishop leading the northern region. The typhoon did not impact the north, but it was still not an easy trek. Mountains and difficult terrain made the journey slow. 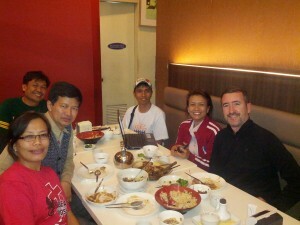 After six hours of travel, Sam was able to meet up with Bishop Pete Torio and his wife, Joyce. Sam joined the UMCom team which consisted of Nhots Celzo, a Filipino who is currently working for the UMC in IT, marketing, and website management, and April Gonzaga-Mercado, UMCom field staff who is very involved with the relief efforts from Typhoon Haiyan. Sam and the team members joined Bishop and Mrs. Torio for dinner to understand the technical requirements and learn a little about how Torio uses the Internet. He described very long hours spent working in his office because it was the only place to get an Internet connection. He would even spend the night there because he had no connection at home (5km away). Installation at the Bishop’s house was part of the process to build a WiFi connection. It was clear that Torio was a man dedicated to his work and to serving his community, and that extending an Internet connection to his home would allow him to better reach his people and conduct church business without having to sleep overnight at the office. Needless to say, the Bishop and his wife were very excited at the possibility of getting a broadband connection that would allow him to be more efficient and to work from home when needed. Sam and the rest of the team were set to start the next day. 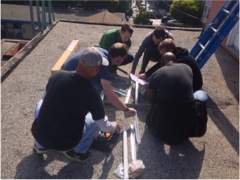 Morning came and the team began by getting a radio installed on the roof of the UMC 6-story office building. The only way to access this roof was through a small window on the top floor which quickly proved to be a feat in acrobatic moves. Once the team was through the little window and on to the roof, the installation went rather smoothly and quickly. Soon they were off to the other side of the link – the Bishop’s residence. The project’s main challenge was hard to miss – a 4-story building directly in the way between the Bishop’s office and home. Determined as ever, Sam knew there had to be a way the team could literally “get around” this issue. The team traveled to several nearby buildings to see if they could get a signal from the neighbors’ balconies. What was previously an Inveneo/UMCom project now quickly turned into a community activity. Residents in several buildings were more than happy to open their doors and let these strangers (and all their equipment including the Inveneo Cable-Free Survey Pole) in. Sam remarked that walking around the community was the one of the most enjoyable parts of the project. 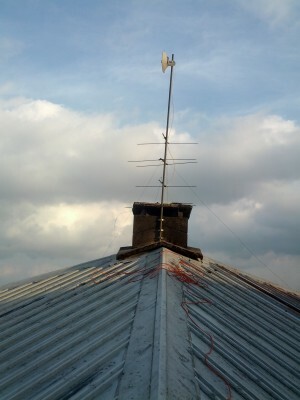 At last the UMCom and Inveneo teams were able to relay a signal by attaching the receiver to a long pole and placing it on the Bishop’s roof on his house. Within the same day they were able to do a full installation that included configuring a radio, cabling, setting up the modem, and installing the software. Sam and the rest of the team successfully installed the 5km Internet connection. Currently the Bishop is the only one in his neighborhood that has Internet at his house, and this opens the door for network sharing that he and his wife are very happy to offer their neighbors. In the future though, and as other neighbors get their own WiFi connections, this won’t restrict the bandwidth of the Bishop’s Internet. Getting online to serve the community. Just the very next day, the Bishop had Internet access at his house because of the combined talents of the UMCom and Inveneo teammates. This will help him spend more time at home with his family, allow him to connect and serve local congregations better and communicate globally as his position requires. In addition, the Bishop and his family can offer their neighbors access to broadband Internet that’s fast and reliable. By the end of the project, Sam was very pleased to see the increased capacity of the local UMCom workers. He knew of their previous skill sets, but this challenge of finding a signal and setting up a WiFi connection in mountainous terrain will help both Nhots and April in future projects. Sam considers UMCom to be a valued partner to the Inveneo team saying “It was a feel good project.” He felt the team worked very well together on this challenging installation. The partnership between UMCom and the ICT engineering non-profit Inveneo has been one of continued growth. Collaboration is key in an ICT project like this, and with the combined efforts of UMCom and Inveneo, the enduring partnership is easy to see. In 2011, the Petzl Foundation hosted Andris Bjornson, Inveneo’s Chief Technology Officer, and Jen Overgaag, Senior Project Engineer, and in 2012, Matt Crum, Sam Perales, and Eyleen Chou, Inveneo Project Engineers, for a Tower Access and Rescue train-the-trainer course at the Petzl America headquarters in Utah. This course was designed to provide invaluable hands-on training for Inveneo staff and enabled Inveneo to develop a training curriculum and a safety equipment kit with Petzl’s work-at-height safety experts. These skills and $10,000 in donated Petzl tools will be used to train and kit our extended Inveneo team and our in-country technology partners, helping them deploy safe practices in configuring broadband Internet networks on communication towers in the developing world. Often, setting up these networks involves large-scale tower climbing to position equipment correctly. Our entrepreneurs, though not new to technology, are often new to climbing or have haven’t formally learned safety skills. These trainings are critical to the safe set-up and delivery of our broadband networks, and we proud to share these invaluable skills with others. 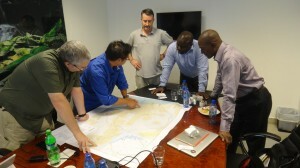 Based on the Petzl training, Inveneo implemented two trainings in Haiti and trainings in Eldoret and Nairobi, Kenya. In Haiti, where we are implementing the Haiti Rural Broadband Network, communications technicians were anxious to learn safe climbing techniques and were very interested in trusted climbing equipment. 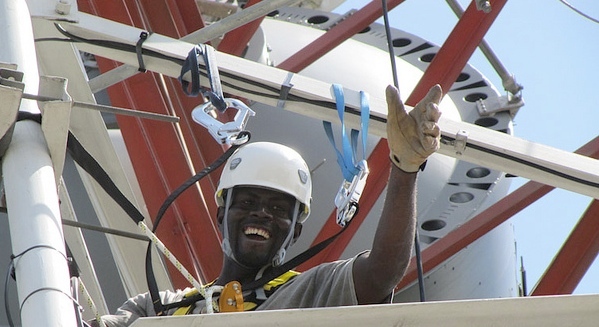 Inveneo’s Haitian partner, Transversal, continues to use the training and equipment they received on a daily basis as they roll out and maintain remote tower sites. 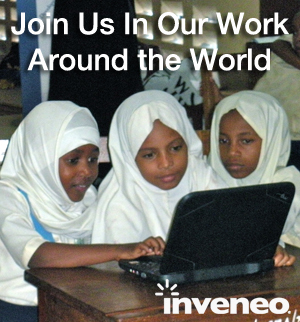 As we move forward in 2012, Inveneo will be expanding our work on broadband networks in East Africa. The investment in the Petzl-Inveneo training will continue to provide security, confidence, and dividends in many countries and for many people.